The Prince Street cycle track has been fully open for a few months, is very well used and is functioning pretty well. BCyc raised a few queries about some elements of the design and we hope that action will be taken on these where possible as well as lessons learned for future schemes. Minor snags aside, overall it’s a good example of high-quality, segregated infrastructure and demonstrates that if you ’build it and they will come’. Prince Street now links to a new segment of track on Wapping Road. Unfortunately the ongoing development of Wapping Wharf means that the track is currently not continuous over the junctions. We have been assured by officers that, on completion of the next phase, the gaps in the track will be filled in to creat a continuous segregated route from the Louisiana pub to the Centre. We will be keeping an eye on this and definitely holding BCC to their word. A scheme for redesigning Redcliffe Way is currently being developed by officers at BCC. 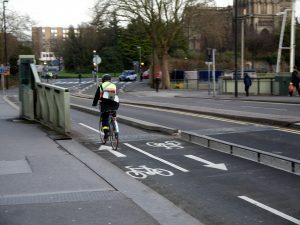 Cycling officers, backed by us, are pushing for a fully segregated cycle track to link to the existing one on the Redcliffe Bascule Bridge. This would be a much-improved connection between Bristol Temple Meads and the Centre at Broad Quay. 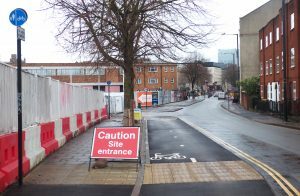 Officers have also been proceeding with developing proposals for a segregated cycle track over the Old Market underpass that will link into the Castle Park-Baldwin Street route and we hope to see action on this in 2019. We also discussed the potential for a segregated cycle track along Victoria Street. This is part of BCC’s Draft City Centre Framework and there is certainly adequate width to achieve this. Victoria Street is an important link between the city centre and the Temple Meads transport hub and could be a really useful cycle route. 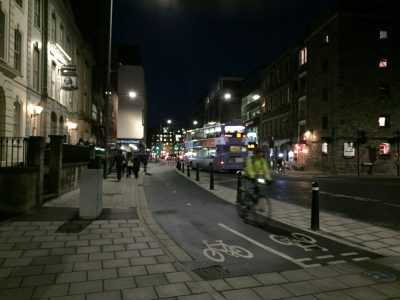 There is still a lot to do and there are still major barriers to cycling into the city centre and these will require extensive and expensive work to remedy. 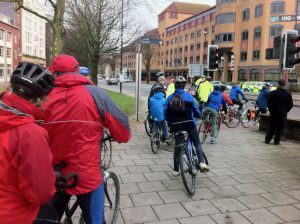 However things are certainly on the up for cycling in Bristol city centre and we are now at a stage where some of the investment in segregated tracks is starting to pay off as sections become whole routes and therefore the beginnings of a usable cycle network.